I decided to use ‘Petal Palette, a new set from the Spring Summer Catalogue (page 23) and design a card. 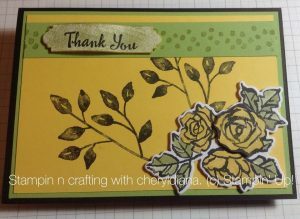 For my first card I have used a Basic Black A5 base for the card, then layered a Pear Pizzazz card base onto Daffodil Delight card base. By using the leaf stamp and a Basic Black ink pad I stamped two sets of leaves. I took a length of Daffodil Delight ribbon (from the annual catalogue) and wrapped it around one end of the card bases. Then I stamped and die cut the set of flowers and leaves which I coloured in using a Pear Pizzazz and Daffodil Delight marker pen. I love these pens as they have a brush end and a fine pen end. Once this was coloured in I then stuck it onto the card using stampin dimensionals. 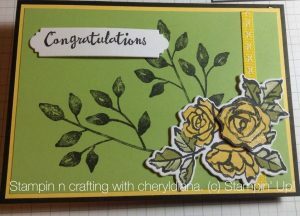 Finally I stamped the Congratulations sentiment and die cut it out. This was also stuck on using stampin dimensionals. I could not decide what way round to have the colours so I had to make a second card. For this card I swapped over the colours of the base card. Again the leaves and the flowers were stamped and coloured as in card 1. I decided to stamp the Thank You sentiment and sponged Pear Pizzazz over it. I added a strip of Pear Pizzazz card stock and stamped the dots in Pear Pizzazz to which I stuck the sentiment to. Finally I added another large flower to each card to make it more 3D and added some Wink of Stella to the leaves and the main flower. I hope you have enjoyed visiting my blog. I hope that these will help to inspire you to try this colour combination for your next project. Now it is time to visit Tracy Lewis’ blog and see the amazing project that she has created for this month’s colour combo blog. Just click the button below to visit her blog. Lovely cards Cheryl, and one of my favourite stamp sets too. Thank you. Sometimes just by changing things round you end up with an even better card. these are two wonderful cards! I don’t know why, but prefer the yellow one a little bit more ;-). Thank you for your comment. Sometimes doing the colours in a different way work out better. I like the two options and switching the background colours, really changes the card. Thank you. I agree swapping colours around shows lovely variations. It also gives a different view. Great cards! Both are beautiful but I think I like option two a little bit more! Thank you for your comment. I often do options like this s each one can look different.